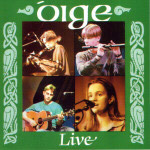 Óige (pronounced oy-ga) is the young irish band Cara had formed with three friends when most of them were still in their early teens. She was 15 at that time, the youngest member just 13. In spite of the constraints of touring only during their school holidays, Oige's reputatuon grew fast. This album represents a fragment of their concert repertorie, most of the songs are trad. Their skill and dexterity of instruments playing is wonderful, especially considering that they play 'Reel' (the more difficult tune in Irish music). Of course, Cara sings with a voice of pure unearthly beauty on the track 02、04、07、09 and 11. I was particularly impressed with her singing without accompaniment (on "Green grasses grow Bonnie").